You know the crazy wireless camera our readers love that lets any iPhone or Android phone see where no normal smartphone can? Well the upgraded version is on sale today on Amazon at its lowest price yet. The Depstech 1200P Semi-rigid Wireless Borescope Inspection Camera is new and improved compared to the original model, and get this: it has a crazy-long 33-foot length! Use the coupon code OCNRZTAY at checkout and you’ll only pay $29.99. 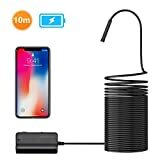 WiFi Connection, High Compatibility: Via WiFi from endoscope WiFi box, this unit can work with Android 2.3+devices & iOS 6.0+, breaking through different plugs limits. 2200 mAh Batteries, Longer Working Time: lager than 2000 mAh capacity, Depstech endoscope can work up to 5H after fully charged, unlike those camera only working a few minutes.